EZ Blood/Cell DNA Isolation Kit is designed for isolating genomic DNA from whole blood or cells. The kit is based on selective binding of DNA to silica membrane in the presence of chaotropic salts. Blood or cell lysate is prepared by digesting cells with Proteinase K in a specially formulated lysis/binding buffer that allows protein denaturation. RNA is removed by RNase digestion. The lysate is then mixed with ethanol and applied to the silica membrane-based spin column. Impurities are removed by washing steps. Genomic DNA is eluted in low salt elution buffer. The purified DNA is suitable for PCR, restriction enzyme digestion, southern blotting and other molecular biology applications. A. Genomic DNA was purified from blood (lanes 1-4) and cells (lanes 5-6) using EZ Blood/Cell DNA Isolation Kit and analyzed on 1% agarose gel. M: Lambda-HindIII Ladder. 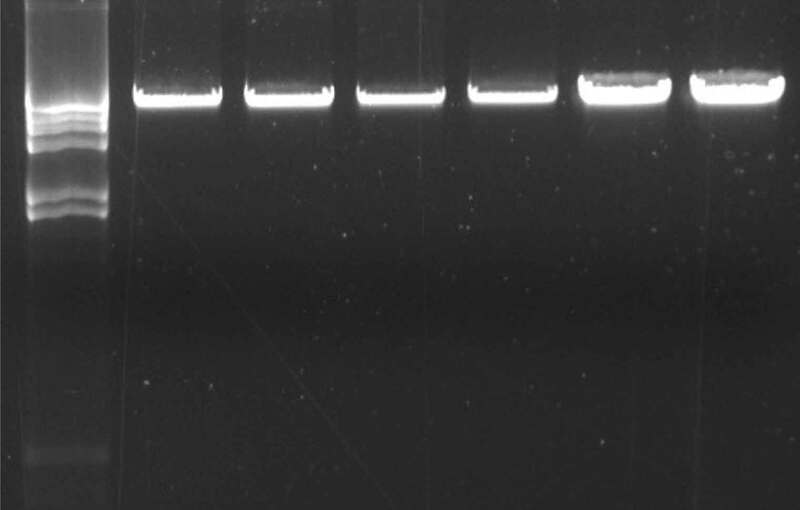 B. PCR amplification was performed on DNA isolated from blood. Lane 1: 498 bp amplicon from AP2 gene. Lane 2: 881 bp amplicon from MVP gene. M: 100 bp ladder.